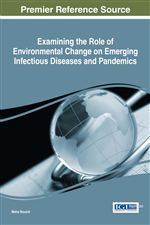 This chapter provides a review of infectious disease to date and the challenges they may present in the future. The main pandemics that have driven the history of humanity are described, from the first to be recorded in 3180 BC to more recent ones such as AIDIS, SARS and others associated with emerging pathogens. The essential role of emerging scientific specialisms (particularly microbiology, public health and sanitary engineering) to our understanding of the causes of these diseases (and how they may be better monitored, controlled and prevented) is presented. Globalization and climate change, determining factors for the ecology of infectious diseases and their emergence and re-emergence, are discussed and point to the urgent need for research to deal with these threats that continue to have a significant impact on human development and wellbeing. In recent decades, concern about the quality and sustainability of the environment has been increasing and this is now a critical global issue, involving both industrialised and low-income countries. The influence of the environment on human health dates back to antiquity, when human life expectancy was shorter than today as a result of the hostile environment in which they lived. Infectious diseases have been a health hazard faced by humanity since human beings first appeared. These diseases spread from person to person or from animals to humans, often through water, food or insect vectors and so transmission may be directly affected by environmental changes (Yassi et al., 2001). Hippocrates, in his treatise “Airs, Water and Places”, described the importance of these environments to the spread of diseases and made an association between human infection and the characteristics of climate, soil, water, diet, and living conditions (Nelson & Williams, 2014). The impact of infectious diseases on human populations has influenced the history of the world, not just because of their devastating physical, economic, cultural, political and social consequences, but also because they have driven the development of several scientific and technological areas, such as microbiology, epidemiology, immunology, medicine, engineering, biotechnology, food safety and occupational infection control. In the second half of the last century, with the advent of antibiotics and vaccines, some people believed that infectious diseases had been controlled, but this confidence declined with the appearance of emerging and re-emerging pathogens in 1980s. The emergence of these infectious diseases caused alarm because of their potential global spread and resulting health impact and coincided with economic globalization and climate change, both of which represented determining factors in their spread. Consequently, understanding the ecology of these pathogens is increasingly considered an essential component of management and control strategies for these diseases. The aim of this chapter is to describe the history of infectious diseases and major human epidemics, as well as the significant features and discoveries that supported the control and prevention of these diseases. The historical report outlines ancient history, the post-classical era (Middle Ages) and modern history (early, middle and contemporary periods). The establishment of regulations/environmental quality criteria and health education, as important measures to deal with and reduce infectious diseases, are also highlighted. The final part covers the role of the environment in the transmission of these infectious diseases.